An exterior view of the Growthpoint Industrial Estate in Meadowdale, Germiston. Growthpoint’s industrial property portfolio in the East of Gauteng recorded good leasing and development activity in 2017. 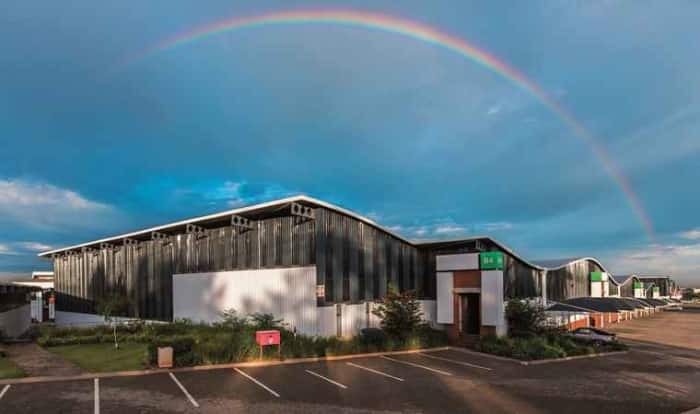 Industrial property emerged as the strongest performing commercial property sector overall in South Africa, despite the tough economic conditions. Growthpoint has noted that Gauteng’s East Rand was a hot spot for industrial leasing. In 2017, the fund concluded seventy deals in this region, forty new and thirty renewals, covering over 146,499sqm and a total value of R260 million. During 2017, Growthpoint signed several major deals in key industrial areas across the East Rand. Growthpoint Industrial Estate in Meadowdale, Germiston, has now been developed into a massive 80,000sqm park in total. Only two sites of 2,000sqm and 4,000sqm remain available for bespoke development to client requirements in the secure estate. 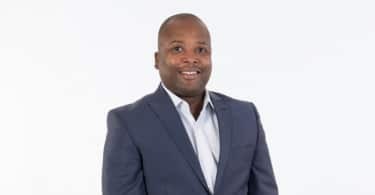 The latest developments here include a warehouse for Pick n Pay retailers to service online shopping, which Growthpoint undertook in joint venture with Improvon. The warehouse, which also includes a small office component, spans 7,500sqm with an option to add further space of up to 3,000sqm. Also, Growthpoint completed a specialised development that will see Fast & Furious Distribution move into a new 10,200sqm warehouse at Growthpoint Industrial Estate as its business grows. In January 2018, it relocated from its current smaller space to its new larger building, which is designed to support the logistics company with features like cross-docking. “We are thrilled to help Fast & Furious achieve their growth strategies and to be part of their business journey. Fast & Furious is one of a growing number of long-standing clients whom we have helped by changing their space to match changes in their business” says Binedell. Otis also recently took up 2,370sqm in Growthpoint Industrial Estate. Its premises includes space for warehousing, operations, sales and maintenance. It is also planning to install a lift within its new training academy to use for training purposes. Otis’s location within the estate provides a secure environment for its staff and visitors alike. In neighbouring Meadowdale, Growthpoint renewed its lease with Namibia Logistics (Namlog) for a 7,700sqm warehouse and, at the same time, the supply chain group also signed up for a 1,000sqm extension. This will right-size the facility’s ratio of warehouses to offices and continues to grow the well-established relationship between Namlog and Growthpoint. Namlog’s Meadowdale operations base enjoys excellent access to all major transport routes. Growthpoint also signed various other deals in the Meadowdale area during the year, totalling over 3,600sqm. In November 2017, Growthpoint acquired a logistics facility in nearby Meadowbrook, Germiston for R132m at a 9,25% yield. The freight facility spans 16,654sqm and is occupied by a long-term client, Heneways Freight Services, with an extended lease of just over six years remaining. Also in Germiston, Growthpoint renewed Goodyear South Africa’s 17,700sqm facility in Greenhills, which includes a specialised store. The warehouse received upgraded parking and new polycarbonate sheets were installed to maximise natural light, making it more efficient. The property provides excellent accessibility to the airport. 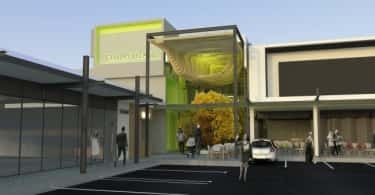 At Isando Industrial Park in Kempton Park, Growthpoint started the year with a large vacancy, however, six deals later it has filled this park, which offers spaces ranging from 150sqm to 400sqm. It is neatly nestled between two main roads in Isando, Barbara and Isando roads, and has good proximity and access to the highway, making it a sought-after location. In Boksburg, Growthpoint signed new client Lulatec for over 4,100sqm of space for its steel fabrication business in Jet Park. Growthpoint also secured some key lease renewals at properties across the East Rand in 2017. In Sunnyrock Ext, Germiston, it renewed over 3,050sqm of space for Kawena Distributors. In Boksburg East, it renewed 45,181sqm for DCD Group. Growthpoint also renewed Tiger Consumer Brands in over 8,120sqm of storage and warehousing space in Industria. “The East Rand, especially its established industrial areas with good access to major roads, has proven to be of specific interest to businesses in the current market, and we expect this to remain the case in 2018,” concludes Binedell.